Panelized houses are more than just kits. When Ned and Anne Hammond began to consider what type of home they wanted to build, they did what most of us might do — they began to study every house they encountered. They originally thought building from scratch might make the most sense for their new home, which was to be located on the coast of Massachusetts. The Hammonds wanted to take advantage of the panoramic views. They also wanted their house to feel as open as the ocean it would overlook. 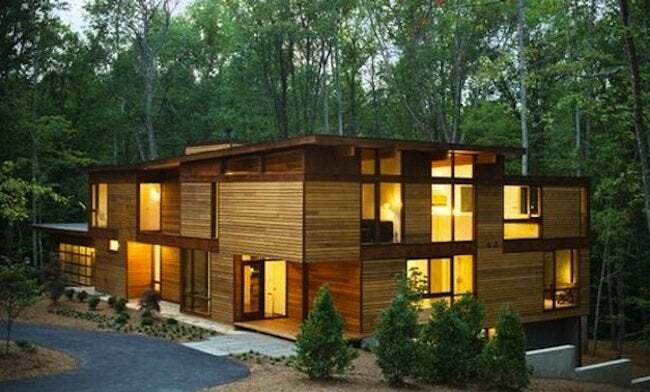 Eventually the couple decided that building a panelized house would be the most resource-efficient strategy. After some consideration, the Hammonds hired Acorn, located in Acton, Massachusetts, to design and manufacture their home. A panelized house is a pre-engineered structure. The theory behind this type of construction is that when a building is pre-built in a controlled environment, the craftspeople will not be affected by weather, lack of materials at hand, or the other obstacles that arise whenever one is building a house on site. Acorn’s portfolio of plans includes over 50 designs. The idea behind the stock designs is that the customer doesn’t have to pay to reinvent the wheel. Each home starts from a standard design and is customized to the client’s unique needs. While each home is individually designed and built, the buyer benefits from the discount on parts that are made in quantity. After the designers and clients decide on a finalized plan, the manufacturer begins building panels and milling the components of the house. The coding of materials is a critical aspect in erecting the new home on its site. Each piece of material is marked with a unique number code. Acorn’s coding system basically consists of three series—the 100, 200, and 300. Each hundred represents a floor. For instance, 101 would be the first beam that would be secured on the first floor. After that 102 would be laid and then the rest of the series would be used sequentially. Although this is a simplified description of the code Acorn and other companies use, it gives an idea on how well organized the system can be. The Hammonds’ home is very different than the original drawings. In most cases, a manufactured home can offer as much flexibility in design as one designed from scratch. Ned and Anne chose a plan that met most of their basic design requirements. Like a post and beam house, the Acorn plan they chose did not rely heavily on interior load bearing walls, which meant there were several ways the interior could be divided. One of the main benefits of panelized construction is that the manufacturer furnishes the customer with all the drawings and the materials to build the house. Acorn does not insist that their customers buy every material from them. For instance, if a client wants to include a unique type of roofing material, the company will deduct the cost of the package plan’s roofing from the total cost. The two most important factors in building a house are the quality of the design and the quality of the people that execute the work. Building a panelized home does require some special training, and companies typically have a list of certified builders. Because the Hammonds had worked on several building projects with G.F. Peach, Inc., and were familiar with the above-standard work the Peaches and their crew do, they wanted to hire them to build their new home. The one challenge of bringing the Peaches on board was that they had never put up a panelized home. Assembling a panelized home has much in common with traditional stick building, but there are some hints and procedures that will help the contractors save time and effort. The Peaches were able to work with the designers at Acorn to develop the necessary skills to properly assemble the Hammonds’ design. Generally, all the house parts fit in a few truck loads. In optimum situations the builder stores all the materials on the site. Due to the ocean-front buffer zone and the city’s conservation commission’s requirements, the Hammonds could not do that. Instead, they had to load everything into a barn that was a short distance from the site. Instead of simply grabbing the next needed and marked 2×4 or 4×4 from a stack, the crew would have to anticipate as much as they could and haul materials from the barn every morning. If during the day they needed more materials, they would have to take the time to go down to the barn. Because of the complications in the permitting phase of the project, the building phase began only a few of months before the New England winter set in. The local weather is relatively mild, but the ocean-front location is always unpredictable. Because the home’s basic framework arrives partially pre-assembled, the builder was able to win the race against mother nature. The path of the sun throughout the year and ways to orient the house to benefit from natural solar gain and cooling efficiency. Location of various rooms to receive sunlight at the appropriate time and to take advantage of the best views. Designing the house and its interior spaces to flow with existing land contours for minimal disruption of the site’s natural beauty. Which trees to keep, and which ones to prune or cut to maximize views. Prevailing wind patterns for maximum heating and cooling efficiency. The location of the well, septic system, and driveway, as well as other services such as water, telephone, electricity, and gas. Low or wet areas, natural drainage patterns, steep slopes, or hidden ledges that might influence the location of the house.